The Ukrainian pianist Sergeï Salov has taken home the highest honours at this year's Montreal International Musical Competition, winning the First Grand Prize in the piano competition and also capturing the People's Award--quite a response to the doubting voices of his critics. 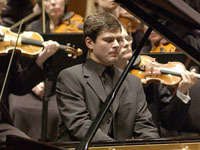 Salov's professionalism on stage made it clear that he was no stranger to international competition or to performance with an orchestra, and the force of this artistic experience was ultimately what set him apart from the other musicians. I had the chance to meet Salov on a few different occasions during the event, and I was struck by the depth of his artistic vision. He is no mere collector of trophies, but a musical explorer--one who embraces both strength and weakness in his search for moments of creative truth. After his performance at the Gala Concert with the OSM, he was kind enough to answer a few questions. LSM: What was your motivation for joining this year's competition? SS: I have to admit that I wasn't aware this was a "new" competition. I just thought I was going to participate in the major competition in Montreal where Ivo Pogorelich was a past winner. But it makes no difference--I'm sure this event will soon be recognized around the world as a proper successor to the "old" competition. Also the fact there were nine finalists made it very interesting. It means we all had a greater chance of making it to the finals. I also like having to play just twice for the judges. It means not so much stress for the musicians, and the judges can be more attentive because they don't suffer any burnout. LSM: Did you think you had a chance of winning? SS: Well, I thought I could do well but I never expected the Grand Prize! My real goal was to play the Brahms Piano Concerto No 2 with an orchestra one more time. I really love this work and hope to have lots more opportunities for working with an orchestra. This award from the MIMC will help make all of that possible. LSM: What was you favourite part of the competition? SS: Actually, my favourite memory is simply of walking through the streets of Montreal. It's such a pleasant city to be in. Everyone's smiling and relaxed, there's lots of space--quite an inspiring place to live. As for the competition, I'd have to say the best moment was just 20 minutes ago, seeing the audience rise to their feet for an ovation. It's such a moving moment for any musician. LSM: What are your plans for the future? SS: My concert schedule for the year is just winding down. And I've just had a birthday, played the Brahms Piano Concerto No 2, and won the Grand Prize here. It's all too unbelievable; maybe I should take some time off! But I have concerts to play in England in the fall, and I'll be back here in Quebec next January. And I have to finish school in July. That'll be 10 years of formal study finally over. LSM: What advice would you give to young musicians hoping to compete internationally? SS: First of all, I would tell them not to aim just at becoming successful on the competition circuit. You have to love the music for what it is and what it can be--it's the connection between your inner self and your musical explorations that makes everything worthwhile. This Brahms concerto is a good example. It's not just a display of skill. It's a living memory of his life and impressions, from the time he was playing piano in beer halls right up to when he became the most celebrated composer in Vienna. You have to be ready for the same honest exploration of your soul if you want to come close to recreating that kind of spirit. So I think young musicians need to be wary of the desire for competitive glory. Awards from a jury are fine things, but it's your love of the music that will make your career stand the test of time.